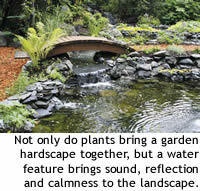 When designing your landscape, let your imagination go beyond the soft green stuff. Think hardscapes – stepping stones, boulders, trellises, patios, rock waterfalls, retaining walls and more. Hardscaping can help you add interest to your landscape, define an area, create privacy or extend an outdoor living area. Hardscaping is like the frame that showcases a piece of art, says Elise Huggins, landscape architect at Earthscape. Those hard elements can form the backbone of your lawn and garden. Use elements that harmonize with the home, Huggins advises. If your home is modern, use modern materials like granite. If traditional, try brick or hard stone. Anvy Crawford of Faltz Landscaping says to think "feng shui" when it comes to hardscaping. "It defines the basic flow of the yard and can remedy problems in site conditions while leading you to an artistic focal area." Retaining walls can hold back an eroding hillside, create topography where none existed and help define areas of the landscape for different uses. Incorporating stairways into retaining walls can increase the usable area of your landscape. Many people consider steep slopes in their yards as a negative, but they really lend themselves to creative and interesting landscape designs. The solutions to potential landscape problems, Crawford says, "can create that balance that we all need in our lives and make for a relaxing, calming environment." "Use fountains and waterfalls with different varieties of plants along with lighting and large boulders or natural stone benches and tables," Crawford recommends. "Natural stone can turn unusable space into level area for patios or decks." As with many home projects, you must hardscape for your climate. "We design our yards so that they flex with Alaska soil," says Crawford. 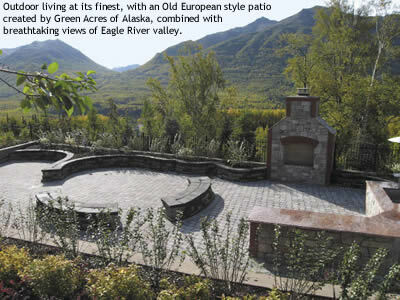 "Alaska's ground moves so we use dry stacking walls and dry set brick pavers and patios, which allow things to flex." No hardscape is complete without its complement, softscapes, says Jon Cobb of Green Acres of Alaska. "As the plants, lawn and ground covers are added, they will soften and warm the hardscaping. When planting around patios and pathways try to include some fragrant varieties. It is important that plantings look good, but considerations for smells and sounds are often overlooked. Think about plants that will attract birds or add a bird feeder," he says. "Nothing makes a landscape come alive like the sight and sound of moving water, so we will often run waterfalls over retaining walls." The leading trend today is outdoor living, Cobb says. We're seeing complete living room sets with weather resistant cushions and outdoor kitchens that include a fireplace, refrigerator, and granite countertops. "People want their home to extend into the outside and hardscapes make that possible." Even when the snow falls, hardscapes "provide structure to the lawn and garden by adding lines and giving form to a normally flat area," adds Huggins. With lighting, well-designed retaining walls and the right selection of plants, winter can be the most beautiful season of your landscape, Cobb says. "The best part being that you don't need to weed or mow the lawn in the winter!"